Choo-Choo all aboard another trip on the Rumor-Train! Last week, reports made by Forbes reporter Mark Hughes claimed that the first official photos of Ben Affleck donning his Batman costume as well as Gal Gadot’s WW costume would hit the web sometime this week. Now not only has that not happened, but apparently the wait has increased. 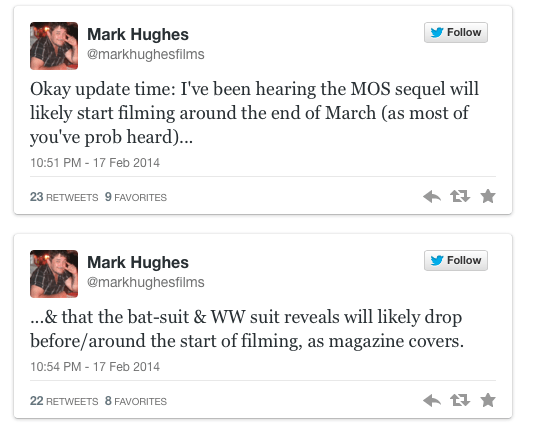 Hughes is backpedaling and on Twitter he says that we will not see the actors in costumes until March. I think it goes without saying, control your anticipation for this news. His sources haven’t proved reliable so it might be best to not get our hopes up. I, like all of you, was very amped at the notion of the first photos of Batfleck so together let us all let out a big groan..ugh. The potential release of the photos coincides with the beginning of the filming for Man of Steel 2 so we still have a couple more weeks to go. God speed everyone.